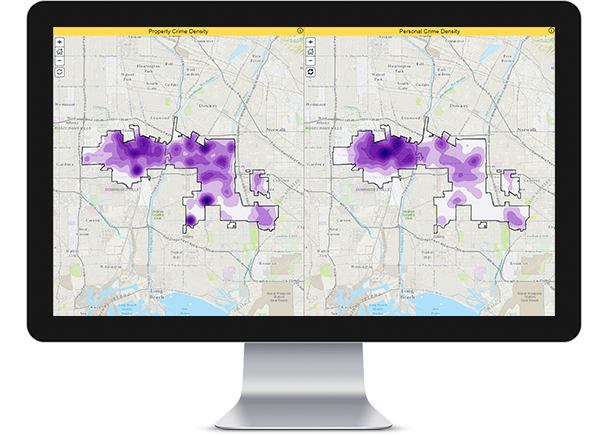 Spatial analysis allows you to solve complex problems and better understand where and what is occurring in your world. It goes beyond mapping alone to let you study the characteristics of places and the relationships between them. If the spatial component is important to the problem, spatial analysis lends perspective to your decision-making. Have you ever looked at a map of crime in your city and tried to figure out what areas have high crime rates? Have you explored other types of information, like school locations, parks, and demographics to try to determine the best location to buy a new home? Whenever we look at a map, we inherently start turning that map into information by analyzing its contents—finding patterns, assessing trends, or making decisions. This process is called “spatial analysis,” and it’s what our eyes and minds do naturally whenever we look at a map. Spatial analysis is the most intriguing and remarkable aspect of GIS. Using spatial analysis, you can combine information from many independent sources and derive new sets of information (results) by applying a sophisticated set of spatial operators. This comprehensive collection of spatial analysis tools extends your reach toward answers to your questions. Statistical analysis can determine if the patterns that you see are significant. You can analyze various layers to calculate the suitability of a place for a particular activity. By employing image analysis, you can detect change over time. These tools and many others, which are part of ArcGIS, enable you to address critically important questions and decisions that are beyond the scope of simple visual analysis. Here are some of the foundational spatial analyses and the ArcGIS tools that get them done. Spatial analysis is a process that starts by asking a question. Getting the question right is the key to working out what tools to use and what analysis to employ toward deriving a meaningful answer. Being able to better understand your data should help you to make appropriate decisions about your analysis—and anticipate how your choices will affect the results. The web is now a source of vast amounts of data, and spatial analysis offers the means by which this data becomes valuable. As the value of analysis and spatial data gains adoption, methods and models for how to use analysis are becoming more widely available. Academics, professionals, communities, and individuals are all sharing their analytical techniques. 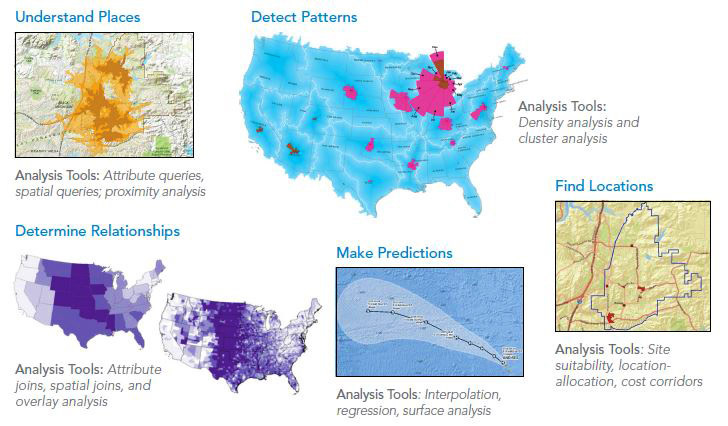 These spatial data analysis practices cut across many disciplines. The applications are endless, and embracing a multidisciplinary approach to spatial analysis can bring significant rewards. GIS analysis helps you to make informed decisions, but it doesn’t make the decisions for you. Doing that requires your expertise. For example, you learn that multiscale web maps can require analysis to be done at multiple scales since, for many aggregated datasets, the results are only relevant for the scale at which the analysis is performed. You’ll also need to learn to interpret results carefully—you should have an idea of the expected results and carefully check the analysis if the conclusions differ significantly. As more communities see the power that analyzing their data with location brings, GIS technology is being pushed to new levels. Data from disparate sources is being combined, and new information is revealing new patterns and insights. Even the concept of geographic space is undergoing a challenge, as we map data using both physical and social geographies. Web maps bring spatial data and the notion of spatial analysis to everyone. The idea that location matters is no longer just the geographer’s doctrine; its value has been widely recognized and embraced. Geography matters.